Could a coup really happen in the United States? September 09, 2015, 7:55 p.m.
A law professor at West Point was forced to hastily resign after it emerged that he had authored a number of controversial articles. In one he suggested that legal scholars defending the rights of suspected terrorists could be considered legitimate military targets, while in another he examined a potential military coup in the United States, arguing that officers may have a duty to sieze control of the federal government if the federal government acted against the interest of the country. The United States military has long embraced the idea of civilian control of national affairs, and apart from certain rare moments the American officer corps has faithfully followed the orders of their civilian superiors. YouGov&apos;s latest research shows, however, that officers in the military are held in much greater esteem than their civilian superiors, and that they are widely viewed as having the best interests of the country in mind instead of their own selfish concerns. 70% of Americans believe that military officers generally want what is best for the country. When it comes to Congressmen, however, 71% of Americans believe that they want what is best for themselves, along with 59% for local politicians. 29% of Americans could imagine a situation in which they would support the military seizing control of the federal government, while 41% could not imagine such a situation. Republicans (43%) are more than twice as likely as Democrats (20%) to say that they could conceive of a situation in which they would support a military coup in the United States. Independents tend to say that they could not (38%) rather than could (29%) imagine supporting a coup. 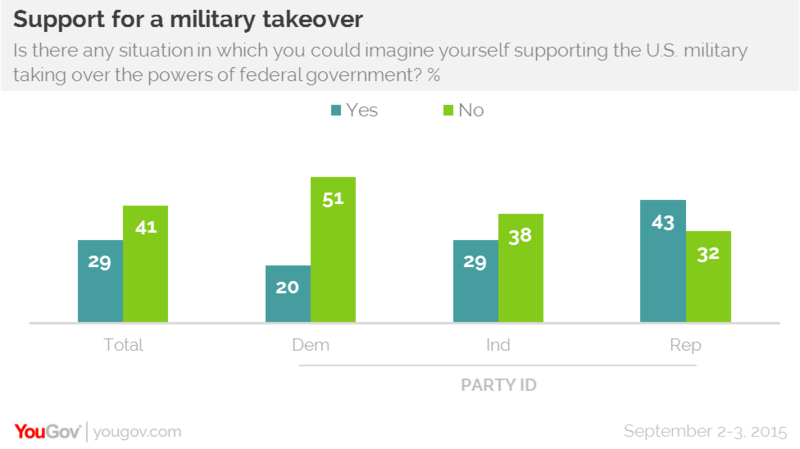 The proportion of the country that would support a military takeover increases when people are asked whether they would hypothetically support the military stepping in to take control from a civilian government which is beginning to violate the constitution. 43% of Americans would support the military stepping in while 29% would be opposed.